Cd’s when are they obsolete ? Discussion in 'Music Corner' started by pocofan, Apr 7, 2018. This article might explain why there are so many like new DVDs in charity shops. People buy them, watch them once or twice, then dump them. CD's, on the other hand, are still technically the same (if not better) quality as their lossy counterparts and even lossy streaming. CDs and the FLAC, APE, ALAC (or whatever lossless you like) derived from the those CDs are always superior to lossy MP3, AAC, OGG etc. It's the definition of lossless vs lossy. DTK, Cronverc, nosliw and 2 others like this. I hate to be a troll but do you have a DVD/Blu-Ray Player? A modern disc-based gaming console (not including PS4 [for some reason])? An in-car CD player? A computer with a disc drive (yes less common with newer laptops and desktops, but still)? The reason why I'm asking is because I see a lot of people saying that they "don't have a CD player" and I mean sure they may not, but I always like to think that they are likely to have at least one disc drive in their possesion in some form. CD seems like the lowest priority with newer indie music. Many artists are even favoring limited cassette runs over a cd pressing. I've been watching a number of YouTube videos about cassettes (including one about the last cassette factory in the country) and it seems like cassette is making a small rebirth, not to the level of vinyl but still a rebirth. I think one factor that favors the compact cassette is that an artist/group can easily make the tapes a few tapes themselves if they have to using available equipment (even if done in real time it is possible to make four or five tapes a day with two decks). While it is also possible to make your own CDs, I think the retro nature of cassette is one of its appeals. I suspect another reason is the availability of streaming access to programs that were previously released on DVD. As an example, I recently purchased the first six seasons of Star Trek - The Next Generation because I wanted to be able to watch the show uncut whenever I wanted (I noticed that some reruns contains edits). Now I've got a Netflix account and the entire run of Star Trek - The Next Generation is available (I wasn't aware of that until I got Netflix) so the DVDs are redundant. Now, I only purchase DVDs after I confirm they are not available on Netflix. The ones I purchase tend to fall into the following categories: (1) It is not available on Netflix and it is a program that I'm sure that I will enjoy, (2) it is a program/movie that I've enjoyed on Netflix and always want to have it, or (3) contains special features that make purchasing the DVD worth buying (many anime DVDs from AD Vision fall into this category). Just be aware that stuff on Netflix comes and goes, so one day you may wake up and find TNG is no longer on Netflix. I have all of DS9 on DVD and I've seen that series disappear and reappear a couple of times over the years. So your DVD's are not entirely redundant! snowman872 and nosliw like this. I agree and that's why I will still buy series that I always want access too. As an example, I purchased the entire anime series The Big O on DVD despite having seen it on Cartoon Network because it was so good that I knew by the end of the second episode that I'd get it on DVD as soon as it was released. It was so good that I'm surprised that a live-action version hasn't been considered. Although it is a giant robot anime, the story itself is so intriguing* that at times the robots are almost an afterthought. *Something happened 40 years ago that caused everybody in the world to forget everything before that point. Occasionally people remember something and are compelled to act on that memory and that often leads to problems. nosliw and dkmonroe like this. They can have it. I think the newbies to cassette should experience the same disappointments I did. klockwerk, efegarcia, Chooke and 3 others like this. The point I was intending to make was that the proliferation of disc drives, especially in legacy playback devices, is more widespread than a lot of people realize. I will say though, my post came off as worse than I intended. DRM and wrat like this. Yes, where else but vinyl can you get scratches and pops? Who’s talking about vinyl? No arguments though. Vinyl is far from a perfect format. 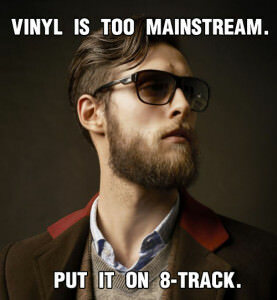 I think that is what often gets lost in the arguments about analog vs. digital: vinyl records has many issues too. That is why it was common practice to record the LP/45 to cassette tapes for regular listening. That is why I've thought that magnetic tape is a better way to listen to music than vinyl records, although the limitations of the compact cassette make it less than an optimal format. I think that if a format like the elcassette or RCA Tape Cartridge (double the speed and double the width of the compact cassette) had been properly marketed and pushed it might have been able to supersede the vinyl record or at least become a parallel format to the LP (either one is an option for albums). Actually, back in the day, DAT cassettes were widely believed to become the successor to analog cassettes. They were far superior sound quality wise although they had similar tape issues of wear, stretching and degradation over time. The recordable CD put an to end to DAT and USB drives are putting the sword into recordable CDs. Why anyone would prefer the old analog cassettes over flac files on a rewritable USB or SD card is beyond me. Well.. I don't know how many people have a cassette player in some form and working??? I know I do but I am weird. I think there are and would be a lot more working CD players in future than tape decks. I can't imagine cassettes coming back in a big way. Now if we talk about an 8 track that's a different story . Now if we talk about an 8 track that's a different story . dalem5467, nosliw and Uglyversal like this. The Recording Industry fought strongly against the introduction of DAT and didn't support the format (few albums were released in the format) due to concerns about illegally copying of CDs. This caused delays that killed the format's momentum and eventually killed the format for the home consumer, although it survives as a professional format. The format was not suitable for on-the-go portable use due to the rotating head configuration. I think that a "Walkman" type DAT machine would not have lasted long due to the complexity and fragility of the tape transport (I could see the player getting one hard bump and that's the end of it) However, it is possible that they might have found a way to overcome the issue. The affordable recordable CD (which you mentioned). This allowed people to use existing equipment to play their recorded CDs (although some CD players could not play recordable CDs). There was no need to purchase a completely new format for recording. For many people the Compact Cassette (CC) was already good enough for their needs. The introduction of better formulations (Type II and Type IV) along with improved noise reduction options (Dolby C, Dolby S, and dbx) and better recording decks and players allowed the CC to hold its own against the other portable formats. I had a Digital Compact Cassette (DCC) deck and portable, and a Minidisc (MD) deck and portable, and after both formats flopped I purchased an excellent CC deck (for a fraction of the cost of the DCC and MD decks) and found that got results that held their own against both DCC and MD. PhantomStranger and Gaslight like this. Computers with CD/DVD/Blu-Ray ROM drives. Still having the cassette player is the least of the problem. Most of them won't be working (specially car players) because they are full of perishable parts and while you can get belts you need other rubber parts which are not easily available for a lot of decks. The reviews at the time showed that most people could not tell the difference between the CD original and a DCC copy. The codec reduced the audio data to 20 percent of the original. I thought the tapes I made at the time sounded fairly good. I thought the format would succeed because you could play your old cassettes on DCC decks/players, giving you a massive library of available tapes even without DCC tapes. Thus, even if the format flopped I'd still be able to get tapes to play on my deck/portable. Why anyone would prefer the old analog cassettes over flac files on a rewritable USB or SD card is beyond me. Digital recording seems like the obvious successor to me, as well. I never used R2R, but cassette dubs on the other hand I used very frequently in my youth (LP's first, then CD's later). In the early days with small drives and WAV only files + the limitations of sound cards, I could see where digital started off stumbling a bit. But when I look at the offerings today and I would never go back at this point. We've got high-res, storage costs continue to drop, backups are extremely easy to do and the SQ imo is just as good as your source. pitro and Chooke like this. Once cassette players disappeared from car stereos, the end was near for the format. You had boomboxes and car stereos but those were isolated devices and there was no popular successor that supported the format. Today you don't see them in stores outside of cheap boomboxes, and I suspect you'd never see an option on a new car today. CD's, on the other hand, have an extended grace period due to backwards compatibility (as you brought up above) but once DVD/BD players sales drop, CD playback will also. Many newer PC's don't come with one anymore, newer consoles do not, and of course coming standard in cars is slowly going away. So it's only a matter of time at this point. Unless there is a real revival, and major manufacturers start producing quality decks and tape stock again, there is just no future for the compact cassette. Unless that happens, cassettes will be nothing more than a millennial-driven fad, and R2R will be an exclusive niche for the wealthy. It was less lossy than cassettes though and far superior in fidelity to original source on any measurement. Having said that I wouldn't say cassettes sucked more than DAT. AS others have pointed out, they were good enough. Ironically, I no longer have a DAT machine but still have a 3 head cassette deck, albeit rarely used.